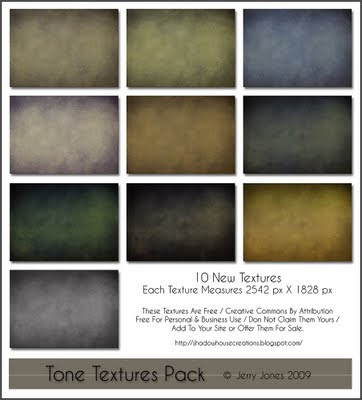 A new texture pack free for downloading, created for tone and tinting use. May it be of some use. Click image for larger view. Beautiful. You are very talented and generous. Thanks so much. Your blog is beautiful, and you are so kind to share these textures with us. Thank you so much. Thanks so much! Love the subtlety of these, looking forward to working with them as layers. Your work is such an inspiration. Thank you for your generosity. Thank you! Your blog post will be advertised on the DigiFree Digital Scrapbooking Freebie search engine today (look for timestamp: 14 Nov [LA 04:00pm, NY 07:00pm] - 15 Nov [UK 12:00am, OZ 11:00am] ). Thanks so much for your art and generosity! I can't wait to try these out! Thank you very much for sharing ! They look great !! Hello ! What a wonderful discovery and thank you for your generosity! I have a question: I do not understand your phrase "....but they may not be posted anywhere but here..." -- does that mean I cannot use them on my photos and post those photos on my blog for example ? Beautiful textures...thanks so much for sharing. I always enjoy your texture packs. Thanks for sharing. NEW CU Freebies Only Forum on Sunday November 15th 2009,in this topic:TexturesYour Place to find Commercial Use Scrap Booking Freebies! Thank you so much for this Freebie. I want to let you know that I posted a link to your blog in CBH Digital Scrapbooking Freebies, under the Page 9 post on Nov. 16, 2009. Thanks again. Gorgeous Textures. Many thanks to you. Your blog and your art is an inspiration to me. Very beautiful set - love the mellow tones! Thanks again! These are simply wonderful & absolutely perfect for my latest piece. Many thanx for the work you do & for making it available to all of us. Your textures & brushes are often 'just the thing' my piece needs to finish it off.